As a hydraulically operated sleeve-type valve, the 800 Series Control Valve is designed for versatility. The basic body can be equipped with several different options for controlling pressure and flow in piping systems ranging from drip irrigation to center pivot end guns. 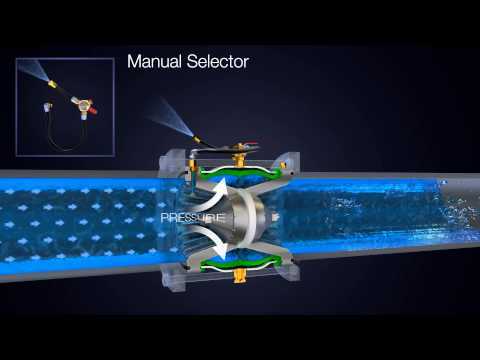 It’s also engineered for extremely high efficiency, resulting in low pressure loss and high flow capacity. NELSON, the quality name in control valves. The MANUAL ON-OFF model of the 800 Series Control Valve is a hydraulically operated sleeve type valve with a manual control function. The ELECTRIC ON-OFF model of the 800 Series Control Valve is a hydraulically operated sleeve type valve with an electric solenoid control. Pressure control valves react or respond through a pressure control regulator. The basic 800 Series Control Valve body can be equipped with several different control packages in various combinations for controlling pressure and flow in large piping systems. The Nelson 800 Series valve can be equipped with the Rate-Of-Flow (Model D18) control to regulate the flow rate passing through the valve.